Charles Arthur Moore married Mary L. Campbell, daughter of John Keyes Campbell and Betsey Sheffield. [S634] Mary Lane Garner, "Charles Henry Griswold," e-mail to James H. Holcombe, 28 July 2007. [S84] Benjamin Woodbridge Dwight Elder John Strong, page 434. Grace Holcombe was born on 20 June 1881 at Bristol, Ontario Co., NY. She was the daughter of Clark M. Holcombe and Etta A. Alford. Marino Torlonia 4th Prince of Civitella-Cesi was born on 29 July 1861 at Poli, Italy. He was the son of Giulio Torlonia 2nd Duke of Poli and Guadagnolo and Teresa Chigi-Alabani.1 Marino Torlonia 4th Prince of Civitella-Cesi married Mary Elsie Moore, daughter of Charles Arthur Moore and Mary L. Campbell, on 15 August 1907 at Old Orchard, Belle Haven, CT. Marino Torlonia 4th Prince of Civitella-Cesi died on 5 March 1933 at age 71. [S618] Gary Boyd Roberts, Royal Descents, page 9. Francis Xavier Shields married Marina Torlonia, daughter of Marino Torlonia 4th Prince of Civitella-Cesi and Mary Elsie Moore, in 1940 at North Conway, NH. Francis Alexander Shields was born on 16 May 1941. He was the son of Francis Xavier Shields and Marina Torlonia.1 Francis Alexander Shields married Teri Schmon in 1964.1 Francis Alexander Shields died on 27 April 2003 at age 61. [S377] Coralee Griswold Griswold 6 & 7 Vol 1, page 49. Mary (?) was born circa 1891 at PA. She married Paul Porter Hayes, son of Porter C. Hayes and Sarah (?). Uriah Goodwin was born on 11 May 1735 at West Hartford, Hartford Co., CT. He was the son of Isaac Goodwin and Hannah Morgan. Uriah Goodwin died in 1782. Eldad Francis Goodwin was born on 15 October 1761 at Hartford, Hartford Co., CT. He was the son of Uriah Goodwin and Mabel Francis. Eldad Francis Goodwin married Lucy Scott on 23 March 1780 at Ashfield, Franklin Co., MA. Eldad Francis Goodwin died in 1827 at Albany, Albany Co., NY. Calphurnia Matthews was born circa 1855. She married Abner J. Holcombe, son of NY Holcombe, on 4 April 1875 at Gallia Co., OH. Calphurnia Matthews died in 1879. George became associated with his father in the manufacture of extracts and compounds, at the old homestead. From there he removed first to Lowell, where he continued the business, and about 1839 he established the firm of George c. Goodwin & Company, on Union street, Boston. Later he moved to Marshall street, and thence to Hanover street into still larger quarters. The firm became well and favorably known, and grew into one of the largest wholesale drug concerns in the United States. He and Jane had seven children. [S637] American Historical Society, "Goodwin and Allied Families." When very young his father moved to Charlestown and afterwards to Lexington, in both of which places he received his education, graduating from the Lexington High School, and entering his father's employ at the age of eighteen years. He inherited many of his father's fine qualities, and applied himself closely to the task of learning the business in every detail. He began as errand boy and worked upwards in the various departments until he was admitted to partnership, becoming the head of the firm when his father died, May 12, 1869. Under his leadership and management the firm grew to large proportions. 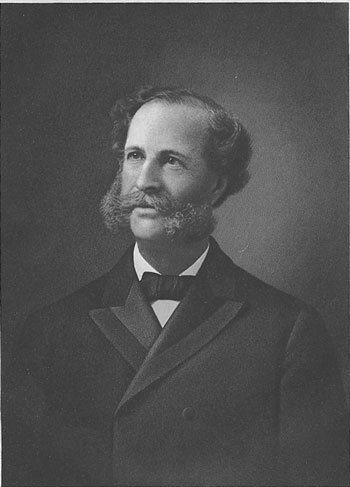 In January, 1900, the business was incorporated, at the time of consolidation with Cutler Brothers and West & Jenny, two other prominent drug manufacturing concerns of Boston, under the name of the Eastern Drug Company, with Mr. Charles Cutler as vice-president, who at Mr. Goodwin's death succeeded him as the head of the company. Mr. Goodwin was prominently identified with a number of important interests. He was vice-president of the National Druggists Association. In 1871 he was made a Mason in the Simon W. Robinson Lodge of Lexington, and was its treasurer for many years. He was afterwards a member of Hiram Lodge. He was exalted in Menotomy Chapter, Royal Arch Masons, at Arlington, March 30, 1866. He was a member of the DeMolay Commandery, Knights Templar, of Boston, and in 1869 he joined the Ancient and Honorable Artillery Company of Boston. He was a member of the Lexington Historical Society, and was a Republican in politics. Caroline Maria Phelps was also known as Carrie M. Phelps.2 She was born circa 1875 at CT.2 She was the daughter of Lorain L. Phelps and Georgianna (?) Caroline Maria Phelps married Herbert Albert Holcombe, son of Albert Elihu Holcombe and Martha J. Keney, circa 1899.1 Caroline Maria Phelps died in 1951. Harley A. Wilson was born circa 1859. He was the son of Andrew Wilson and Julia Elizabeth Holcombe. Myron E. Wilson was born circa 1863 at WI. He was the son of Andrew Wilson and Julia Elizabeth Holcombe. [S638] Barry Boyer, "Jost D. Petrie." Caroline Lowe Patterson married James Smith Bush, son of Samuel Prescott Bush and Florence Sheldon, on 19 January 1929. [S135] Judge Oliver Seymour Phelps Phelps Family, page 1492. [S636] Hazel Fletcher, "William Dean Holcombe," e-mail to James H. Holcombe Jr., 23 August 1947. [S182] Social Security Death Index (on-line), Ancestry.com, SSDI, Ancestry.com, SSAN 452-84-9074. [S135] Judge Oliver Seymour Phelps Phelps Family, page 1384. [S135] Judge Oliver Seymour Phelps Phelps Family, page 1382. [S135] Judge Oliver Seymour Phelps Phelps Family, page 1336. Edith P. Holcombe was born in 1900 at CT.1 She was the daughter of Herbert Albert Holcombe and Caroline Maria Phelps.1 Edith P. Holcombe died in 1925. [S135] Judge Oliver Seymour Phelps Phelps Family, page 1281. Marjorie Merriweather Post was born on 15 March 1887 at Springfield, Sangamon Co., IL. She married Edward Bennett Close in 1905. Marjorie Merriweather Post died on 12 September 1973 at age 86. Anson Phelps Stokes was born in 1874 at New Brighton, Staten Island, NY. He was the son of Anson Phelps Stokes and Helen Louisa Phelps. Anson Phelps Stokes married Carol G. Mitchell. Anson Phelps Stokes died in 1958 at Lenox, Berkshire Co., MA. [S182] Social Security Death Index (on-line), Ancestry.com, SSDI, Ancestry.com, SSAN 020-30-9292. Isaac Newton Phelps Stokes II was born circa 1906. He was the son of Anson Phelps Stokes and Carol G. Mitchell.